This law firm is a rapidly growing workman’s compensation attorney firm representing the largest Southern California businesses. Due to their growth, relocation was necessary. 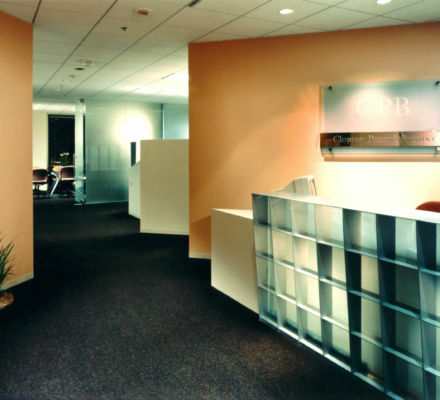 The firm sought out a Class A building downtown Los Angeles. The design problem was to solve the paper processing system, a mass of small folders, which were not quickly retrievable when placed in the traditional closed filing drawers. At the time, due to the cost, the firm was unable to invest in the technology for scanning all files; so alternative solutions were introduced to manage the numerous minimal files. 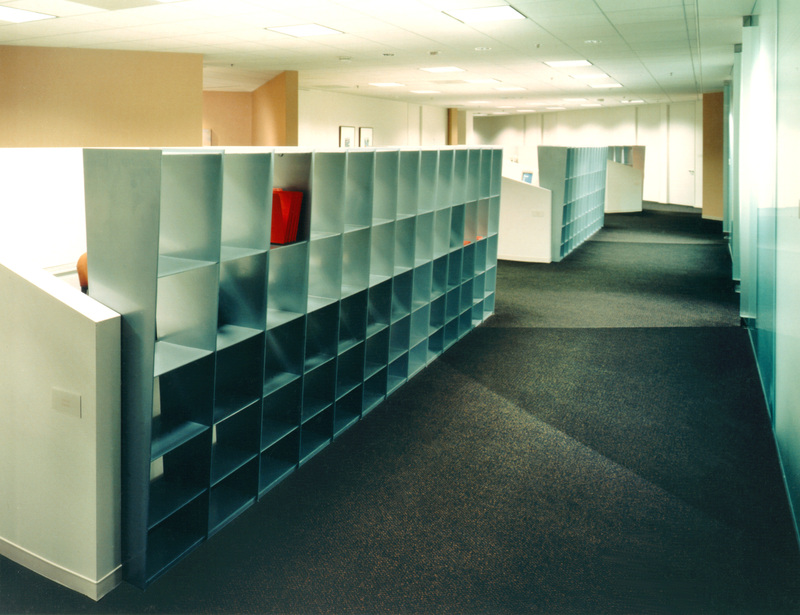 J S D A’s innovative solution was an open shelving system, fabricated from cold rolled steel, formed into a grid with a tapered shape, placed along the corridor system to allow for easy access between attorney offices and secretarial work areas. The grid dimension was carefully coordinated with the height of the secretarial work surface to extend the available work surface area and ease the ergonomic motion involved in organizing the file folders. The grid organizes the plan and provides a repetitive aesthetic element, which is introduced in the reception area. Aligning the architecture with the interior design, the reception area is a perfect square is canted to set up the 45-degree angles characteristic of the building frame, and repeated throughout the space. 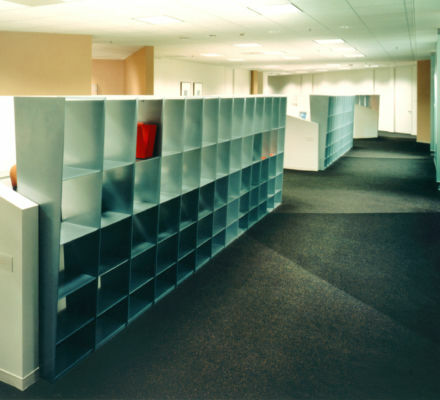 Supplementary solutions include the use of low height drywall to define the triad clusters of workstations in the open area, connecting the steel grid. 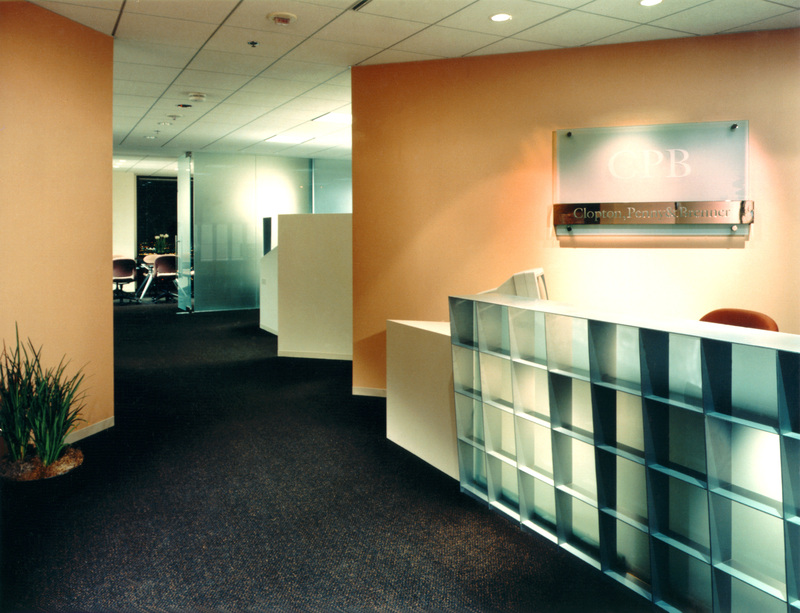 Existing vertical files were recycled and concealed within the perimeter attorney wall, new two drawer lateral files were built into the secretarial stations, and open shelving was provided within the attorney offices. Full height sandblasted glass conceals the main conference room and provides for two additional special private offices which will become conferencing spaces in the expansion plan. Of particular note is the flush detail at the partner office doors. The firm has an open door policy, and literally, the flush condition allows the office area to seemingly extend directly into the partner offices, both with striking downtown views. has resulted in a net savings to the firm of over $25,000 in the first year. This figure represents 15% of their annual rent commitment. The savings over the life of the lease will be more than $250,000.